Hey, more Teepublic tees in the wild! Check out this photo I received from drummer Jamie, aka The Jimmy C, sporting the Vestron Video red-on-black xerox logo! The Aussie multi-instrumentalist has graced many Videogram recordings, most recently performing the roto tom solo on Voorhees Stomp (Extended) on my Camp Blood 10" pic disc EP, but he's got plenty of releases available on Off the Hip (digital via Bandcamp among others), so check him out and give his Facebook page a like here. This and other t-shirts are available via my Teepublic page here. U.S. podcasters Josh and Liam, aka Cinepunx, just shared a nice selection of Videogram cuts on their most recent episode, Talking About Ourselves. At some 90+ minutes in length, the show focus mainly on movies, with this and that thrown in for good measure. It's a free download so check it out here. 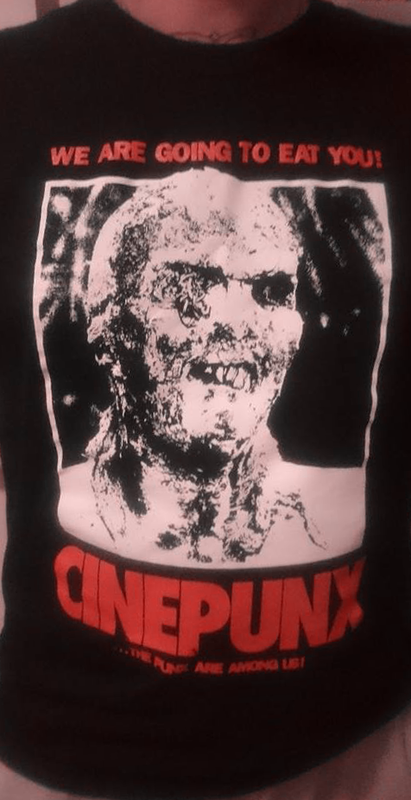 While on the subject, Cinepunx also offer a nice selection of t-shirts - my personal fave pictured left - so give their Facebook page a like here and make sure to check them out! For a bit of more local news, I was recently informed that nordic online store CDon.com now offers both my Pre-Cert LP/CD and Camp Blood 10" EP on import. The chain covers all of Scandinavia, so make sure to check it out here. 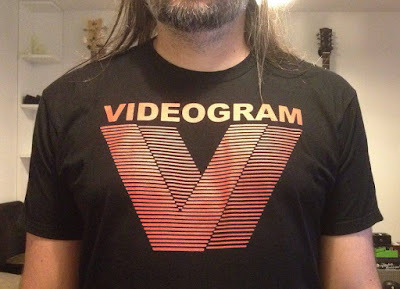 To wrap things up while on that subject, I've updated my Stores, Distributors & Mailorder note on Videogram's Facebook page, adding some new stores (and updated some), including importCDs.com, Merchbar and Reverberation Vinyl - the latter sharing a cool Facebook video of the Camp Blood EP playing in-store! Check it out here and find your store here!